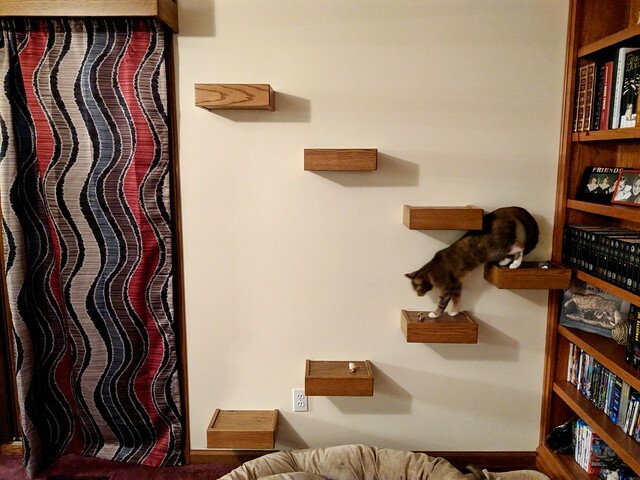 We give them custom-made cat steps. The steps go up to a resting area above the sliding glass door. The installation was done over the weekend; we have to add carpet to each step yet but otherwise it’s done. I was a little worried how it was going to look but I think it turned out well. The cats are still figuring out what the heck it is. When Krissy suggested this as a thing she wanted, I said, “All right, but you know you’re obliging us to have cats until the end of time.” She seemed okay with that. Off to finish this novel.